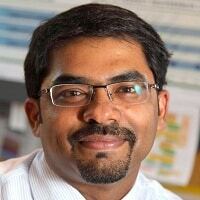 Dr. Madhukar Pai is a Canada Research Chair in Epidemiology & Global Health at McGill University, Montreal; director of McGill Global Health Programs; and associate director of the McGill International Tuberculosis Centre. He did his medical training and community medicine residency in Vellore, India. He completed a Ph.D. in epidemiology at UC Berkeley, and a postdoctoral fellowship at the University of California, San Francisco. He serves as a consultant for the Bill & Melinda Gates Foundation and has served as co-chair of the Stop TB Partnership’s Working Group on New Diagnostics. His research is mainly focused on improving the diagnosis of tuberculosis, especially in high-burden countries like India and South Africa. His research is supported by grant funding from the Gates Foundation, Grand Challenges Canada and Canadian Institutes of Health Research. He has more than 150 peer-reviewed publications. He is recipient of the Union Scientific Prize, Chanchlani Global Health Research Award, and Stars in Global Health award from Grand Challenges Canada.